To fill the paste that's a-kneading. Traditional Old English Mincemeat is well and good for some, but for those who don't eat meat, and for those who shudder at the dietary implications of introducing yet more fat into a holiday diet already high in fat and calories, here is a meatless alternative. In addition to being meat-free, the recipe is also much less involved than the traditional alternative. Note: Not everyone will like mince pie. As a general rule, I would offer that if you don't like marmalade, fruitcake, or raisins, then there's a good chance you won't like mince pie. This recipe is sufficient for 3 to 4 nine-inch pies, using 3-4 cups mincemeat per pie. Halving all ingredients should make enough mincemeat for two pies. Optional: Brandy, rum, sherry, or whiskey to taste. Using the coarse setting of a food processor (or conventional crank grinder), grind cut-up seed orange and lemon (with rinds) and raisins, currants, and the apples (cored and sliced but UNPEELED) and candied fruit. Add cider, bring to a boil and simmer, uncovered, for 15 minutes or until liquid has been absorbed. Add sugar, salt and spices and simmer 10-15 minutes longer, or until thick. Stir in liquor if used. 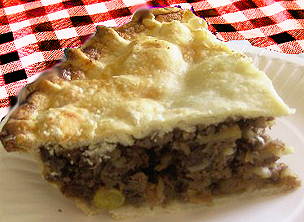 Making the pie: Traditionally, two crusts are used in mince pie. You may purchase frozen crusts, if you wish, or you may make your own piecrust. Place first crust in buttered pie pan and add mincemeat filling. Cover pie with second crust, and bake in a preheated 400° oven for about 45 minutes, or until crust is golden brown. Sprinkle crust with sugar about halfway through baking.